was conceived in 1976 as a response to the death of a boy lost off the back side of Northstar-At-Tahoe ski area during a blizzard. There was, at the time, no organized backcountry ski team to help search for the boy. Desperate phone calls to some local Nordic skiers produced a search party that eventually located the youth, but only after it was too late. This group of skiers, along with the boy's father (who today still remains one of the Nordic Team's most active members), learned there was an important void to be filled. Thus, the Tahoe Nordic Search & Rescue Team was born. Based in the North Lake Tahoe/Truckee area, the Team has matured considerably after these many years but the goals remain the same: Conducting fast, safe rescues and educating the public on winter safety. In February 2006 the California Governor's Office of Emergency Services completed the Alpine Team Guidelines for Search and Rescue Mutual Aid, a document that will help to establish standards guiding Statewide SAR support. TNSAR assisted the Placer County Sheriff's Office in providing a substantial amount of input for this effort, which will ultimately make TNSAR more available for SAR events throughout the state of California. The Team By Laws are available here. consists of a wide variety of individuals. The Team has EMT's, emergency room doctors and nurses, firefighters, professional ski patrollers, paramedics, and MD's as active members. The level of medical, mountain, and skiing skills among the members is very high. In addition to the search and rescues, about 100 people handle Team committees such as training, dispatch, education, equipment upkeep, bookkeeping, the monthly newsletter, and the organization of The Great Ski Race® (the main fund raising event for the Team). General meetings are held the first Monday of each month, October through May, at the Granlibakken Ski Hut in Tahoe City at 7:00pm. New members are always encouraged to join this fun and diverse group. In 2010 TNSAR welcomed the Placer County Sheriff's Office (PCSO) SAR OHV team as a new part of Tahoe Nordic SAR! To become a new member, simply show up to a meeting! Introduce yourself, and meet some of the team members to get a better idea of where you might like to help out. If you are interested in participating in TNSAR trainings, the only additional requirement is that you must sign on for a civil defense card issued through OES, the Office of Emergency Services. Placer County is the local issuing agency for the card; so if you need to sign on please call the Sheriff's substation in Tahoe City for more information (a Sheriff's representative is usually at each Team meeting, too). The station is about 2 miles east of Tahoe City, at 2501 N.Lake Blvd. (530) 581-4038. The Nordic Team is called out many times each year responding to a variety of search and rescue operations. Wandering children, lost hunters, urban disasters, mud slides, avalanches, ski lift evacuations, downed aircraft, and snow-bound shepherds: these are but a sampling of the incidents that the Team has responded to throughout California and Nevada. No two "callouts" are ever the same. The majority of the Team's responses, however, are for individuals lost in the winter wilderness of the Sierra Nevada. The Tahoe Nordic Search and Rescue Team has located hundreds of individuals; the majority of these have been patrons of a ski resort that have strayed from the area's boundary into unfamiliar and rugged mountain terrain. The majority of these searches (and rescues) have historically occurred at night and during poor weather. The Nordic Team has conducted searches originating from most all of the Lake Tahoe ski areas, and has maintained an unrivaled success rate for finding these lost recreationists. Fielding a network of skilled search teams requires constant training. In a minimum of two field training sessions per month, Team members are exposed to a variety of conditions and situations that hone their knowledge. First aid, avalanche safety, navigation, and search techniques are but a few of the practiced disciplines. These skills, coupled with the members' intimate knowledge of the Tahoe backcountry, are vital for fielding an effective search team. Tahoe Nordic Search and Rescue Team does not and could not function on its own. The Team works with a number of agencies including Placer, Nevada, El Dorado, Washoe, Douglas, and Toulumne County Sheriff's Departments, WOOF and CARDA search dogs, OES, American Red Cross, Civil Air Patrol, Naval Air SAR, and the California Highway Patrol. The Communications reserve Teams, fielding a van full of the latest in radio technology, and the Snowmobile Team, who save much time and effort, are two separate volunteer groups to whom Tahoe Nordic Search and Rescue is especially grateful. The Nordic Team also has excellent working relationships with the management and ski patrols of the Lake Tahoe downhill and nordic ski areas. The expertise and professionalism of all these groups have been instrumental in bringing successful conclusions to search activities. The Team's second most important goal is public education. A wide assortment of TV news shots, radio, newspaper, and magazine interviews are conducted annually. Winter Awareness, a Team-produced brochure, is distributed free throughout northern California and Nevada. Every winter the Team's Education Committee presents the North Lake Tahoe and Truckee students with skits and demonstrations about being "Winter Aware". These programs are very successful and very important, for these youngsters are the next generation of winter adventurers. Many books and videos on search and rescue, avalanche science, survival, and outdoor safety have been purchased by the Team and donated to public libraries. The team truck is a 2008 Ford crew cab, specially outfitted to meet team needs. It serves as an equipment cache holding all the tools of backcountry wintertravel: skis, poles, backpacks, stoves, tents, sleeping bags, food, maps, radios, avalanche transceivers, shovels, storm clothing, headlamps, medical kits, climbing skins, rock and ice climbing gear, sleds, snowshoes, etc. Currently there is enough equipment to outfit about 12 skiers for any weather. The truck is housed in the Team's garage in Tahoe City, on land generously donated by the Tahoe City Public Utility District. Snocats are a vital piece of equipment in support of the Team's winter rescues; the machines can transport victims and rescuers when terrain and snow conditions permit. Tahoe Nordic Search and Rescue is fortunate for the continued generosity of the Placer County Water Agency and our partnership with the Tahoe City Public Utility District, to operate two relatively low use-hour LMC 1500’s. 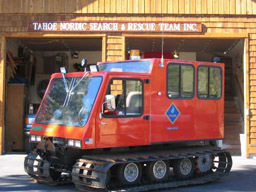 The Tahoe Nordic Search and Rescue Team provides the operation, transportation, maintenance, and upkeep for both LMC 1500 Snocat’s. Check out the Speed TV Intersections program from 2010, which covered the Tahoe Nordic SAR snowcat. While dependent to a great extent on donations, the Team conducts a fund raiser each year: The Great Ski Race®. The race has grown to be the largest Nordic ski race in the West with 1000 Nordic skiers competing along a spectacular 30km route from Tahoe City to Truckee. Other smaller events are held throughout the season, often put on by local businesses on behalf of the Team. Tahoe Nordic Search and Rescue is selective in its endorsement of these events and grateful for all the support received. Tahoe Nordic Search and Rescue Team, Inc. is a highly organized, highly motivated, completely non-profit, all volunteer group. The Nordic Team has full tax-exempt status and is incorporated in California. Starting in 1981 the team produced a Newsletter for team members; the original editor was Dave Fenimore. From 1981 until May 1983 the Newsletter did not have a name; in May 1983 the Newsletter was officially named "Snow Job" (as suggested by Linda Russell). In October of 1989 the name was changed (without any mention in the actual Newsletter) to Snow Line. From August of 1983 to January 1991 the Newsletter sold advertising space ($10 p/ month, $50 half year, $80 full year) to offset the cost. In October of 2003 the Newsletter went online, and sometime thereafter the paper issue was discontinued.